Costume designer Walter Plunkett is regarded as one of the great talents in Hollywood costume design history. He created literally thousands of sketches illustrating some of the most memorable costumes worn by leading actors and actresses in films spanning the 1930s, ‘40s and ‘50s. Specializing in period designs, he studied extensively to get the right look for each character he was contracted to costume. He worked with others, like jewelry designer Eugene Joseff of Joseff of Hollywood, who were dedicated to recreating costuming appropriate to the historical period in which a movie was set. One of his most notable accomplishments was his costuming for Gone With The Wind, especially Scarlett O'Hara's famed frocks. The movie kept him busy for the majority of 1938, and according to a bio released by the publicity department of The Selznick Studio in 1945, he considered this work to be his magnum opus at that time. 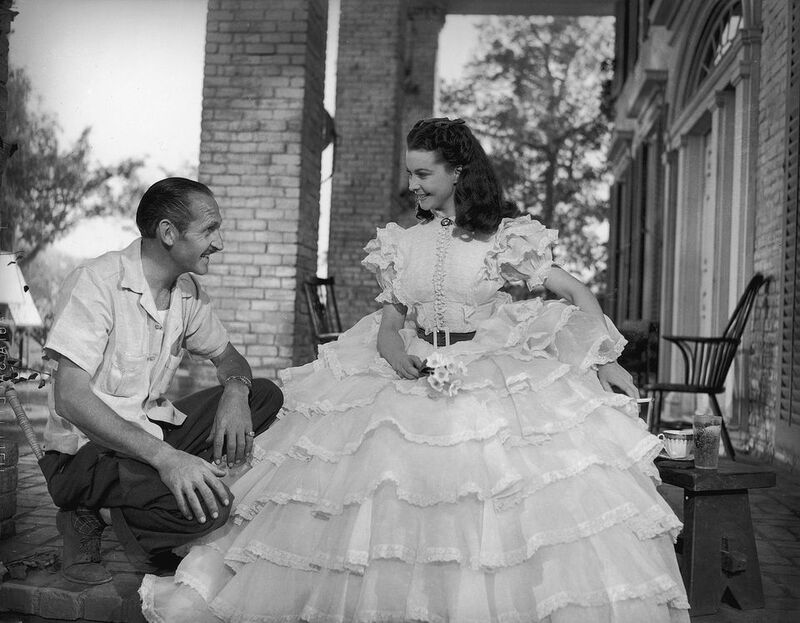 Academy Awards for costuming were not given as far back as the 1930s, but David O. Seznick remarked as he accepted his Oscar for Gone with the Wind, "It's too bad there isn't an Award for costume designing, too, because Walter Plunkett would have received it." In 1951, Plunkett indeed shared an Oscar with fellow costume designers Orry-Kelly (the professional name of Orry George Kelly) and Irene for An American in Paris. Interestingly, Plunkett had known Irene Lentz, who went simply by Irene as a costume designer, since their days working together as film extras in the 1920s. Plunkett’s designs are indeed collectible as works of fashion artistry and highly regarded by movie memorabilia collectors. While the actual dresses are rare finds today, the sketches they were based upon come on the market from time to time. And depending on the film, they can be quite valuable. Many are held in museum archives, including several illustrating this feature. That’s not to say that they don’t come on the market at auction occasionally. Watching auctions of film memorabilia can pay off for Plunkett’s fans, and once in a while a bargain will present like the sketch from the Jane Withers collection highlighted in this feature. Continue on to the next slide to see a Plunkett sketch for the character Scarlet O’Hara from Gone with the Wind. This Walter Plunkett rendering is watercolor and gouache on board framed with swatches of fabric used in production of the dress. This everyday dress style was worn by Scarlett O’Hara in Gone with the Wind as she worked in the lumber mill quite inappropriately alongside her new husband Mr. Hamilton. This rendering from the collection of David O. Selznik is now in the archives of the Harry Ransom Center on the University of Texas campus in Austin, Texas. It was a part of “The Making of Gone with the Wind” exhibit displayed from Sept. 9, 2014 through Jan. 4, 2015. Because it was owned by Selznik, who produced Gone with the Wind, this provenance lends to it being categorized as celebrity memorabilia as well as movie memorabilia. While this rendering will likely never be offered for sale, it would hold considerable value if it were presented at auction. Continue on to the next slide to see a Plunkett sketch for one of Ava Gardner’s dresses donned in Showboat. Artwork like this sketch comes up for auction occasionally when estates of those in the movie industry are liquidated. This Walter Plunkett design was worn by Ava Gardner in the 1951 film Showboat. This example sold via Julien’s Auctions for $1,600 (not including buyer’s premium) in June of 2010. Continue on to the next slide to see a Plunkett sketch from the collection of Jane Withers that sold at auction for only $100. Occasionally collectors can snag a bargain and bring home a Walter Plunkett sketch for a phenomenal price. This example sold for a mere $100 (not including buyer’s premium) at Julien’s Auctions in November of 2013. The film it is associated with is unidentified, which likely contributed to the lack of bidding interest for this rendering. Continue on to the next slide to see a Plunkett sketch of “Bonnie’s Death Ride” costume from Gone with the Wind. This rendering from the collection of David O. Selznik is now in the archives of the Harry Ransom Center on the University of Texas campus in Austin, Texas. It was a part of “The Making of Gone with the Wind” exhibit displayed from Sept. 9, 2014 through Jan. 4, 2015. Because it was owned by Selznik, who produced Gone with the Wind, this provenance lends to it being categorized as celebrity memorabilia as well as movie memorabilia. While this sketch will probably never be offered for sale, it would hold moderate value at auction since it is associated with a supporting character in the film. How Much is Antique Stoneware Worth? Are Old Beer Bottles Worth Anything? Do You Know a Piano from Pianoforte, or a Harpsichord?